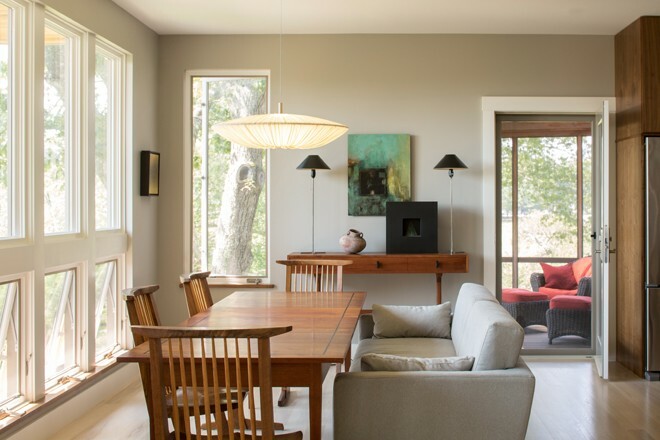 A view of the dining room shows four George Nakashima chairs, a pleated silk and metal pendant lamp, and a couch designed to offset the hardness of the wood elsewhere in the house. 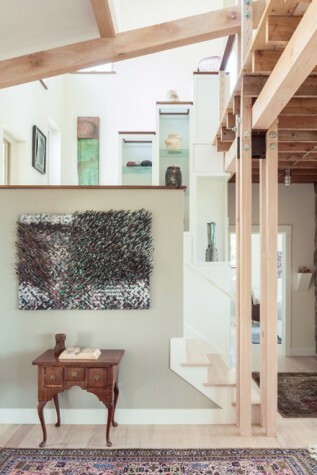 Homeowner Sandy Weisman particularly likes how the black sculpture in the background resonates with the abstract painting. The sculpture is by Jeff Kellar, who shows at ICON Contemporary Art in Brunswick. The painting is by Dean Nimmer, who used to teach at the Massachusetts College of Art and Design. Pickled ash floors are from A.E. Sampson and Son in Warren. 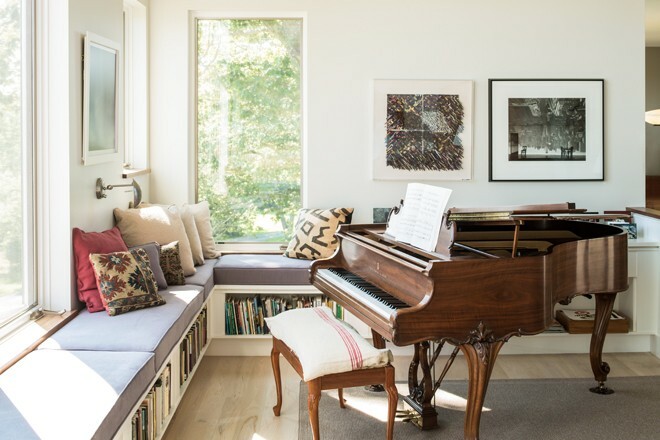 The shelves under the built-in bench allow Weisman to store her books and piano music without giving up the wall space intended for her art. The photograph at the right is by Abelardo Morrell (It's the cover of his book Camera Obscura). The work at the left is a mixed-media piece by Weisman titled Women Work. The kitchen has an open shelf of steel rods and walnut, which defines the space without closing it off. 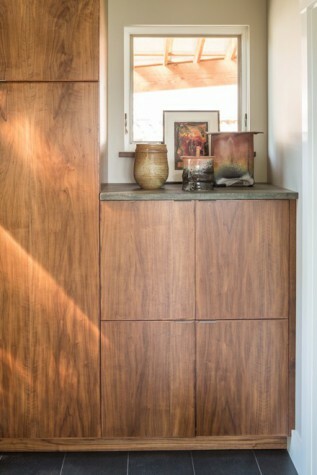 The custom walnut cabinetry throughout the kitchen has minimal hardware. Weisman chose Wild West granite for the countertop, because she likes the suggestion of movement in the stone. It reminds her of the bottom of a riverbed. 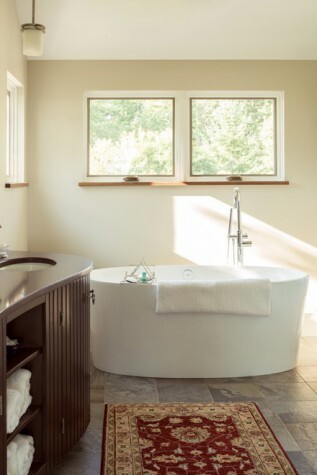 The master bathroom has a custom vanity with a curving front that was designed by architect Paul Hajian. The tub is from Victoria and Albert Baths. The vanity top is Caesarstone. Sandy Weisman working in her second-floor studio. 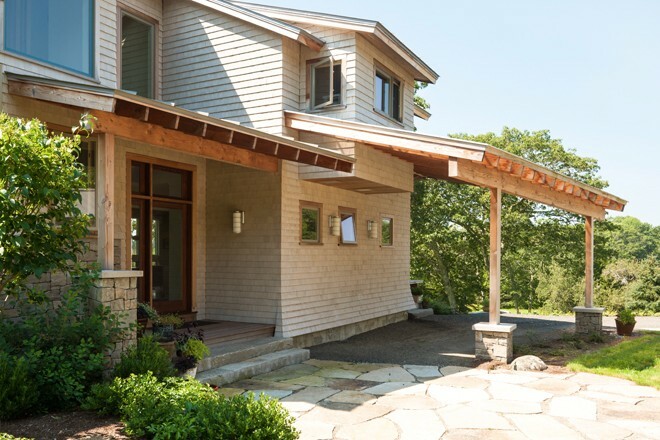 Built on an old sheep farm, this South Thomaston house has a screened porch and master bedroom balcony, both of which take advantage of the shade of an oak tree. The exterior shingles are white cedar and have been treated with a bleaching stain. 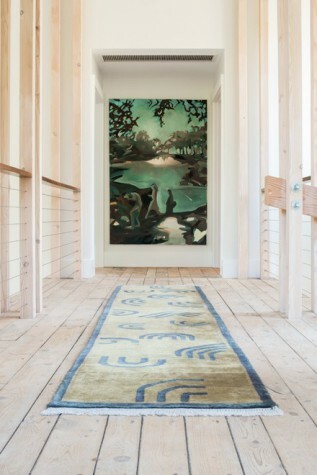 A view of the foyer shows an English lowboy and a piece by Sandy Weisman that consists of pieces of painted paper woven together. A stairwell with display niches for pottery is behind the short wall on which the artwork hangs. Rather than using heavy posts for interior structural support, architect Paul Hajian employed clusters of four slender columns as seen here at the base of the stairs. 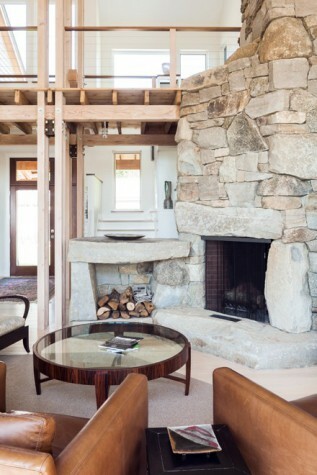 The living room hearth is made of Oak Hill granite and stones found on the property. A niche to the side stores wood. The round table was made by Gregg Lipton. The wood on the second-floor bridge is from a barn original to the property. One of the first pieces of art Sandy Weisman collected was this painting by John Tracey, who Weisman met when she was living in the suburbs of Boston. 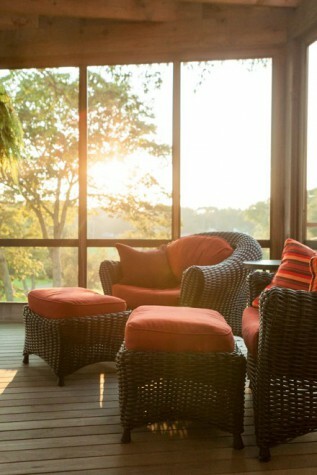 The screened porch at dusk with chairs and ottoman from Home Decorators Collection. From the start, Sandy Weisman—a collage artist, bookmaker, and poet—conceived her retirement home as an artist’s retreat. And not just for herself. In 2010 she purchased three acres of an old sheep farm in South Thomaston from a longtime friend. 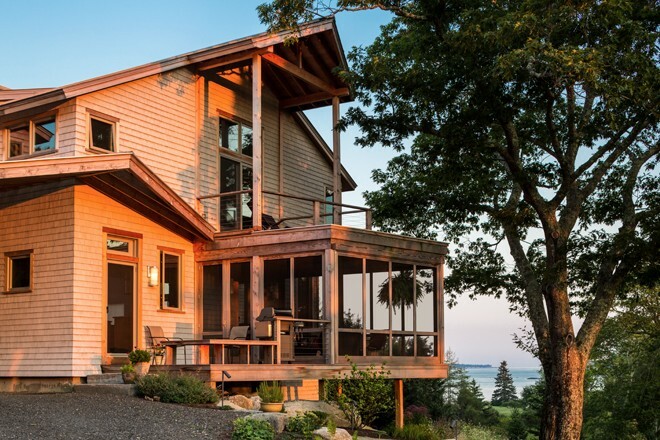 The property had a small house, a barn, and a multibay garage. The barn was in bad shape and had to be torn down. The house was donated to the fire department for a controlled burn. But the garage had potential. 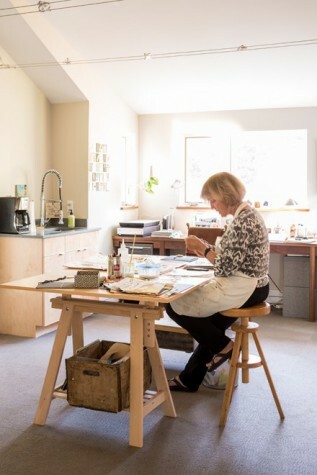 While Weisman built a new home on the property, she converted the garage into studios and an apartment so that students and artists could visit to take a class, rent working space, or live for a short period. 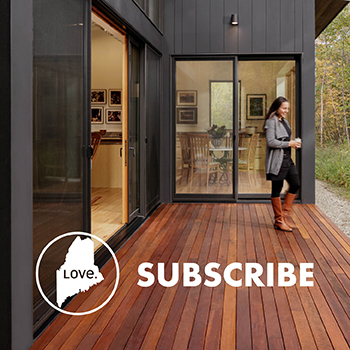 To build her new home and artist accommodations, Weisman turned to an old friend: Paul Hajian, head of the architecture program at the Massachusetts College of Art and Design, and principal (with his brother, David) of Hajian Architects in Watertown, Massachusetts. As she tells it, there were a few things she wanted to do, and there were a few things he wanted to do, and the house is the result. She wanted a modest-sized house with a studio, guest room, and living space in which artists and writers could gather for conversation. She wanted a house geared for solo living that would also be comfortable for her children when they come to visit. As for Hajian, Weisman calls him “a master of light.” He wanted to bring as much light into the space as possible. To this end, his design wrapped the house in windows and brightened ordinarily opaque surfaces by using translucent glass for interior doorways and polycarbonate for the screened porch’s roof. Interior columns were needed for structural support, but rather than using the sort of single heavy post that you might see in post-and-beam construction, Hajian used four slim fir columns, which allows light to pass through even this most essential of structural elements. As much as Weisman appreciated Hajian’s program, she is a collector as well as a producer of art, and she requires wall space to hang work. The need came to be a running joke between Hajian and Weisman. “You can have that window there,” Weisman would tell Hajian during the design, “but I get that wall space there.” Meanwhile, she told her builder, Don Pendleton of Pendleton Builders in Hope, “Don’t you let any electrician put a light switch in the middle of my wall.” The conflicting desires produced a home that is airy and museum-elegant with an impressive art collection that emphasizes photography and abstract pieces. At the front door here is one of Weisman’s own pieces, in which she weaved strips of colored paper to form a sculptural painting. In her living room she has a Morgan Cohen photograph of what looks like the sky but proves on closer examination to be a ceiling with a faint crack. She also has an Abelardo Morrell photograph of a New York City room that has been turned into a camera obscura. 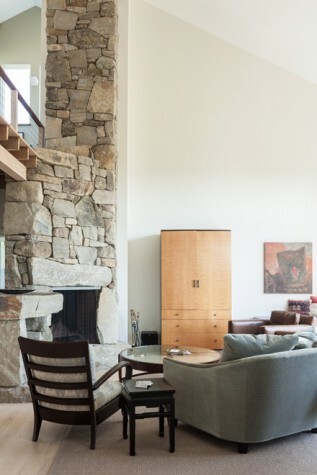 Weisman likes things spare and uncluttered—no fancy mouldings or needless ornament—but she wanted to reference her property and its history where possible. A stone fence crosses her land, and the house is sited so it straddles that wall. 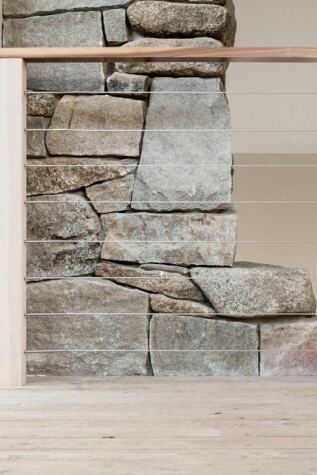 Hajian had the idea of further referencing the wall by building a substantial stone hearth of Oak Hill granite (which is native to Maine) and the lichen-covered stones that are abundant on the property. The hearth has a stone niche where wood is stored. 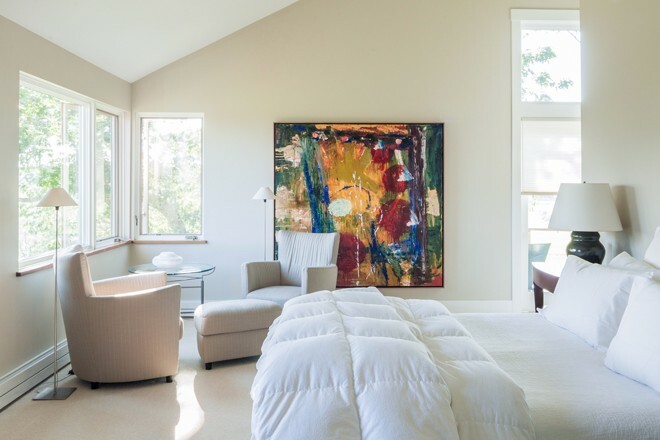 Though the property’s original barn was razed, a portion of the second-floor hayloft was saved, and it now forms an upstairs bridge from the master bedroom to an area that was jokingly labeled the “meditation station” on the home’s plans, but is really a reading and writing room. The original barn was also referenced in the portion of the painted steel roof designed as a shed roof. Some of what is in the home is new—living room furniture from Falmouth’s Simply Home, a round wood-and-glass coffee table built by Gregg Lipton of Cumberland Center, a pleated silk and metal pendant lamp from an Israeli company called Aqua Creations—but some comes from Weisman’s previous apartment in Boston. A family antique sits in the foyer. Her dining room table and sideboard were built in the ’70s by her ex-husband. The table is surrounded by four George Nakashima chairs that Weisman bought years ago, when she visited Nakashima’s studio in New Hope, Pennsylvania. In the new space, though, the dining room table needed more seating. Given that Weisman already had a lot of wood on the ground floor—the teak of the dining room furniture, the pickled ash floors from A.E. Sampson and Son in Warren, and the walnut kitchen cabinetry—she decided to add a little softness to the room by using a high couch from Black Parrot in Rockland for seating. 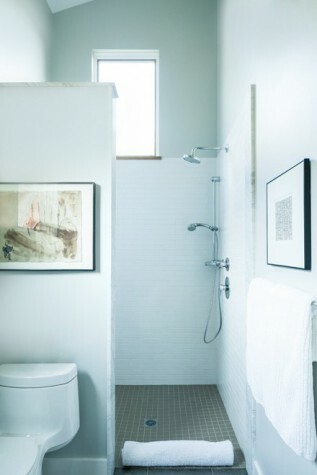 This impulse to contrast a prevailing tendency in the home with a contrary tendency appears elsewhere, as where the vertical, linear quality of the space is coupled with the gentle curve in the dark granite of the kitchen countertop or the undulating shape of the custom vanity in the upstairs bathroom. Similarly, while the old hay floor, posts, and hearth add rougher, barnlike elements to the house, the posts are fastened with slightly rusted steel plates and bolts for a decidedly industrial look. The home has a number of one-of-a-kind surprises. 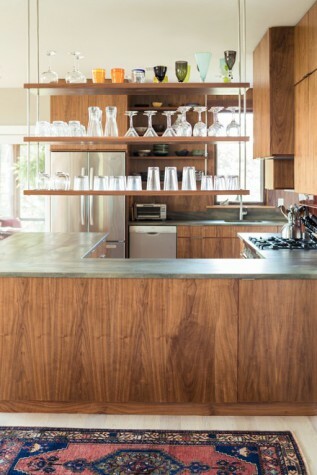 To contrast the lighter colors elsewhere in the house, Pendleton built custom walnut cabinetry and a hanging open shelf of steel and walnut for the kitchen. The upstairs studio has an elegant wall of maple intended for pinning up artwork. The items on the wall’s display shelf can be removed to access a Murphy bed, with the display shelf becoming the Murphy bed’s supporting leg. 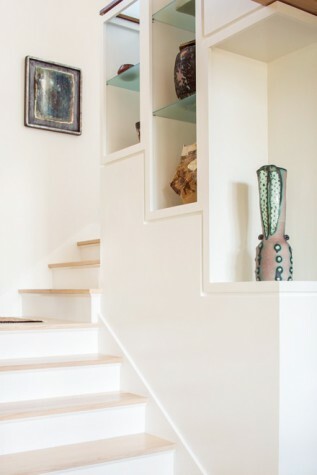 The staircase was turned to create a gap, into which display cases for Weisman’s ceramics collection were placed. The niches are lit from the interior, and because their tops are translucent, they form a series of stepped night lights. “It’s dark when the moon isn’t out,” Hajian says, “and part of the building code is to light the stairs. Whenever we had a constraint, we celebrated it by turning it into something we could feature.” Another example of this? 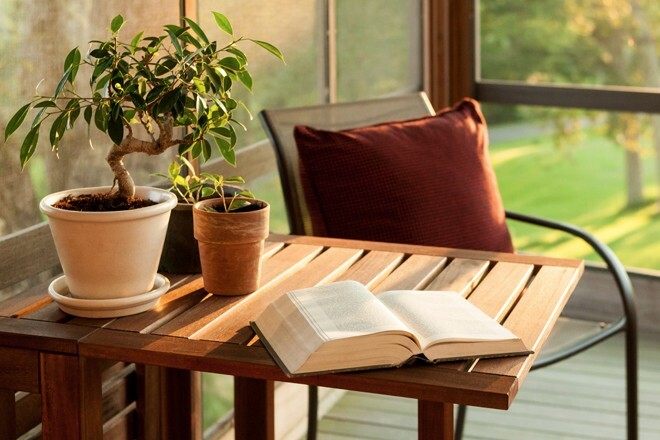 A beautiful oak tree that both Hajian and Weisman were determined not to cut down became an umbrella for the master bedroom balcony and the screened porch. 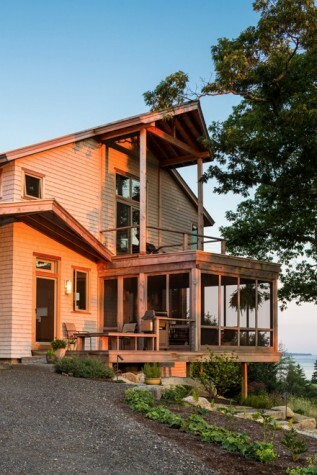 The site takes advantage of the height of the property, welcoming breezes off the ocean and offering a broad view of Mussel Ridge Cove and Spruce Head in the distance. The house’s proximity to the artist’s studios allows for privacy while creating a natural courtyard, so that Weisman can gather students and artists around an open-air lunch table should she choose. Because Don Pendleton didn’t need to do any blasting to work on the site, he told Weisman, “God wants you to have this house.” The artists whom Weisman has drawn to her likely do, too.